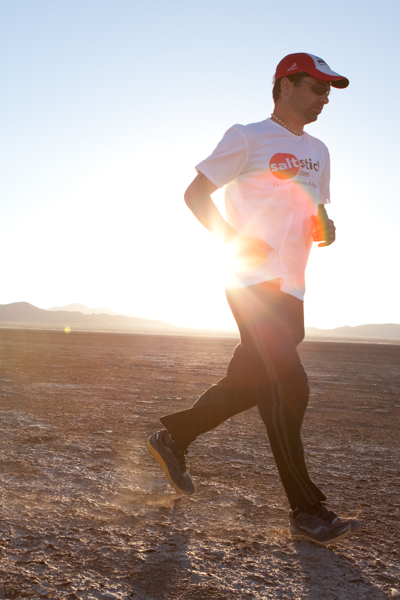 Croix Sather: An Ultra Challenge of 146 miles across Badwater - HE HAS DONE IT! Croix Sather has done it! The last four miles felt as tough as the 142 miles he had run before. His body was shivering from the sub-freezing weather and his blood sugar was low, almost to the point of hyperglycemia. Determination, heart and a record-breaking time motivated Croix Sather to the finish line of the Badwater Solo Self-Contained (SCC) Ultramarathon on Sunday morning. The 41-year-old motivational speaker and author completed the 146-mile run through Death Valley at 7:40 a.m., reaching the peak of Mount Whitney in a record-time of 72 hours, 55 minutes. Sather beat the 13-year-old mark of 77:46 by Marshall Ulrich, the famed ultra-marathon runner, who has completed 124 ultramarathons of 100-plus miles in his career and also holds the record of 52.5 days for the trans-American crossing (3,062 miles). The Badwater SCC Ultramarathon begins at Badwater Basin, the lowest elevation in North America at 282 feet below sea level. It finishes atop Mount Whitney, the highest point in the contiguous United States at 14,505 feet. What made it more challenging for Sather is he had to push a 250-pound cart filled with water, food and supplies because the run requires that a person attempting the feat cannot get any support or assistance. Sather was making his second attempt at Badwater in less than four days. His first try at the treacherous run came on Aug. 19, but ended 45-miles later when his body couldn’t regulate to the excessive heat that peaked at 117 degrees Fahrenheit. On Aug. 23, Sather was back at it again and could sense from the beginning his second effort would be a successful one. He was one of just three people that have ever finished the race. 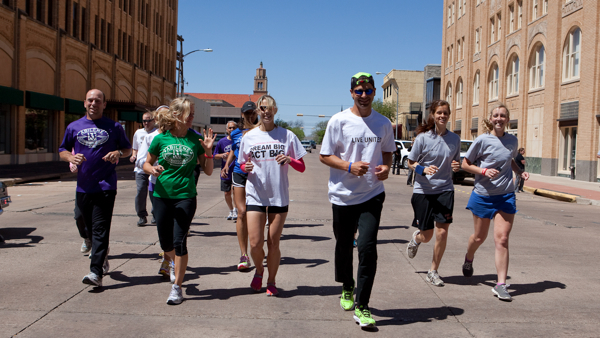 Sather, who ran coast-to-coast in 100 days last year in his Run Across America, covered 55 miles on his first day. 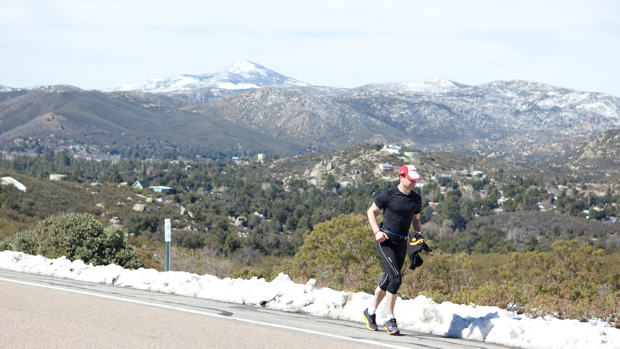 He was aiming to make it to the peak of the first of three challenging inclines, Townes Pass. The Connecticut native did catch a break with the heat of the desert, which can reach as high as 129 degrees. Battling slightly warmer conditions, Sather reached 100 miles by Day 2. Sather arrived at Padre Crowley Overlook, about 80 miles into his journey, during the nighttime. That was a point he was most concerned with, considering its narrow, winding roads and frequent traffic. It wasn’t quite as dangerous arriving to the 3,000-foot mountain with it dark outside. During his three-day ordeal, Sather estimates he slept a total of 3 ½ hours with most of it done in 22-minute increments where he would wake up to the alarm on his watch. He has trained his body to adjust to minimal sleep, a practice known as polyphasic sleep. With his body beginning to grow tired and weary, Sather concluded his last 24 miles up Mount Whitney. The 14,400-foot uphill climb begins with an open road for 13 miles and the final 11 miles on trails. Unlike what the previous runners have done, Sather did not push his cart to the trail. He left it at the base and carried his remaining supplies and 150-ounces of fluids in a backpack. After experiencing scorching heat in the valley, Sather battled sub-freezing weather as he got closer to the peak of Mount Whitney. The last four miles were the most grueling for Sather with fatigue and the frigid conditions playing a big part. Sather didn’t realize that he was getting close to hyperglycemia. He originally thought his lack of energy was largely due to his long journey and downed an energy drink to help get him through it. He realized shortly, after very little affect from the drink, that he was experiencing low blood sugar and needed some food. Once he ate one of his energy bars it did help get him through the trails. But that wasn’t the biggest thing that enabled him to make it to the peak of Mount Whitney. The Badwater SCC Ultramarathon could actually be considered a 157-mile trek. Once reaching the finish, runners still have to go back down the 11-mile trail before someone can bring them back to ground level. Sather is taking some much-needed rest from his latest endurance event. He has a few ideas for his next endeavor, such as a double-crossing transcontinental run that entails traversing across the United States from the east to the west and back to the east. He also is thinking about competing in the Badwater Ultramarathon, a 135-mile race that takes place each July. The 41-year-old motivational speaker and author did what only three people have been able to accomplish, he finished the Badwater Solo Self-Contained Ultramarathon in Death Valley, California. Sather completed the treacherous 146-mile run that stretches from Badwater Basin to the summit of Mount Whitney in a record time of 72 hours, 55 minutes. He bested the old record, held by Marshall Ulrich, by nearly five hours. Croix Sather doesn’t accept defeat too easily. If he puts his mind and all his effort to something, much like he did last year in his Run Across America, he’s going to do everything in his power to accomplish that goal. That’s why the 41-year-old motivational speaker and author will be back in Death Valley, California, on Thursday morning for a second attempt at the Badwater Solo Self-Contained Crossing (SCC) Ultramarathon. Just a few days earlier on Sunday, Sather was looking to become only the third person to finish the 146-mile trek, one that features three challenging inclines with the final 27 miles up Mount Whitney, the highest point of elevation in the contiguous United States. The event, which a runner is offered no assistance and must also push a cart with all his supplies for survival, begins at Badwater Basin, the lowest elevation in North America at 282 feet below sea level. In his first attempt at the Badwater SCC Ultramarathon where he was hoping to set a world record of 60 hours - 17 hours under the existing mark - Sather was forced to call it quits at 45 miles. His legs and muscles felt fine, but he had trouble putting food down and regulating his body to the excessive heat, which reached as high as 117 degrees Fahrenheit. “It was just a series of things that compounded to the point of failure,” said Sather, late Wednesday night, only hours before his second attempt. In his Run Across America, Sather averaged a marathon a day and completed the San Diego to New York City transcontinental run in 100 days. He’s now determined to make his next try at the Badwater SCC Ultramarathon a successful one, too, with a new adjusted goal of 70 hours. While he is aiming to break the record of 77 hours, 46 minutes set by Marshall Ulrich in 1999, Sather will still be content to make it to the finish atop Mount Whitney. Just five people have attempted it and only two have finished. On Sunday, Aug. 19, Croix Sather will embark on the ultimate endurance event, one that will not only test his physical strength but will also do a number on what lies between his ears. The 41-year-old Sather will be in Death Valley, California where he’ll be attempting the Badwater Solo Self-Contained Crossing (SCC) Ultramarathon. 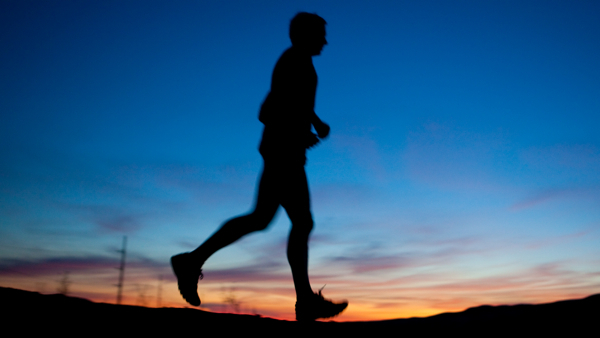 This isn’t just your everyday ultramarathon. In the heat of the Valley, where temperatures can reach nearly 130 degrees, Sather will be attempting a 146-mile trek that includes a series of three challenging inclines with the final 27 miles ascending up Mount Whitney, the highest point of elevation in the contiguous United States at 14,505 feet. By the way the start, which is located at Badwater Basin, happens to be lowest elevation in North America at 282 feet below sea level. And one more thing, he will have to do this pushing a 250-pound cart at the beginning that’s filled with water, food and other survival supplies because he’s not allowed any outside assistance. With a week remaining until he attempts the Badwater Solo SCC Ultramarathon, Sather flew to Las Vegas where he was putting in his final preparation for the event; getting himself acclimated to the heat and feeding his brain with the motivation he’ll need to complete his journey. Sather, an internationally-known author and speaker in the field of personal transformation and the psychology of success, practices what he preaches. He challenges his clients to dream big in their strategies for success and then goes out and proves the amazing power of one’s inner strength. This is not the first time that Sather has attempted an ultra-endurance event. Last year, the Connecticut native averaged a marathon a day for 100 consecutive days in his Run Across America, a 2,621-mile distance that began in San Diego and finished in New York City. But Sather’s latest venture that he is attempting to complete in a record 60 hours, nearly 18 hours under the current mark of 77 hours, 46 minutes set by Marshall Ulrich in 1999, certainly will test his mind and body a bit more. Sather will begin his Death Valley attempt in Badwater Basin, the part of the ultramarathon where the heat is at its peak. He’ll reach the first of his three inclines just past 40 miles, a 17-mile stretch up the 5,400 feet of Townes Pass. The next upward climb occurs around 80 miles, a 12-mile ascension up Padre Crowley Overlook (3,000 ft.). During that particular point, Sather will be running mostly on a narrow, winding road. Sather will continue for another 25 miles and then finish by going up Mount Whitney. Again, he will not just be using his legs. He will still be pushing a cart that’s filled with his supplies for survival. That cart he plans to push up the last mountain until there’s 10 miles remaining. In terms of heat, temperatures have reached as much as 129-degrees Fahrenheit with the pavement as hot as 180 degrees. With the humid conditions this past summer in New England and his hometown of Danbury, Sather has been given somewhat of a sampling of the hot conditions he will have to deal with. When he brings his training inside on the treadmill, he has also developed sauna-like conditions by cranking up the heat in the room and also setting up a blow driver that blasts hot air into his face. That, he believes, will be preparing him most for the extreme heat, primarily at the beginning stages of Badwater. Sather’s training consists of a multitude of things. He hits the roads about three times a week with some training sessions covering 30 to 40 miles. During his runs/walks he pushes a double-baby stroller with two, 50-pound sand bags. “I get some people that yell at me thinking I have a baby in the stroller,” he laughed. It’s also practiced in a room that is heated to 105 degrees Fahrenheit with 70-percent humidity. Sather does the yoga four times a week. Sather, who grew up in Bedford Hills, New York, just outside NYC, was a carpenter by trade until reaching his 30s. It was then that he felt he needed a change in his life and eventually got a degree in Communications and Public Speaking. Sather put that public speaking to work during his Run Across America. During his three-plus month transcontinental trek, he delivered 100 keynote speeches in 100 days to a wide variety of at-risk audiences. “That was a major part of my motivation,” he said. Dealing with adversity has been nothing new to Sather. He survived the ultimate test when he was 14 years old. While riding his bicycle, he was struck by a drunk driver and was critically injured, suffering a broken knee and arm and also fracturing his skull. He was in the hospital for two weeks and was in a coma for four days. “The doctors said I wouldn’t survive the night,” recalled Sather, who underwent rehab for more than a year and had other recurring problems from the accident. When Sather begins his daring journey, he’ll be doing it with bruised and sprained ribs. It was an injury he suffered on Saturday while spending quality time with his wife and two young kids before leaving for his trip the next day. After going to the movies and aquarium, Sather and his family stopped at a local high school so that the kids could ride their bicycles on a path around the football field. His youngest son lost control of his bike going down a ramp near the field and Sather ran over to stop him before he hit a rail. In the process of stopping him, he damaged his ribs. He looks at the setback as just an additional hurdle to clear to reach his intended goal.